When it comes to spring accessories, nothing excites us more than a shiny new pair of sunnies. In fact, we’d go as far to say that a new pair of sunglasses not only signals the start of summer, but it also has the power to totally overhaul the simplest of outfits (and our mood) in seconds. With that in mind, we’ve turned to some of our favourite influencers for some new-season inspiration. The outlook? It’s fairly varied. There’s everything from standout shapes to new hues to timeless investment options right down to punchy perspex iterations. It’s safe to say there’s a style to suit every preference. Sound good? Let us introduce you to what we predict to be this season’s hottest sunglasses. These five trends are a surefire way to update your wardrobe fast. Scroll below to meet (and shop) the lot. 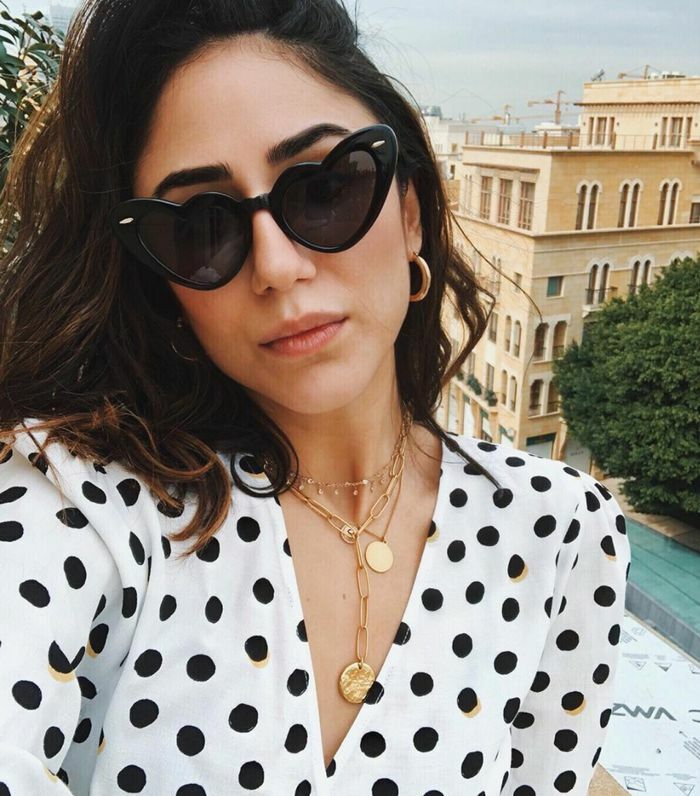 Style Notes: When it comes to making a statement, take your cue from Soraya Bakhtiar and choose super-sized heart-shaped frames. Keep it chic in something neutral or go all out and slip on Saint Laurent’s bold red pair—these are a guaranteed mood-lifter. Style Notes: If you’re not big into bold shapes, look to style supremo Jeanne Damas and opt for something retro. Whether it’s subtle detailing or elegant rounded edges, these super-flattering sunnies will be the perfect pairing for all those pretty tea dresses we’ve been frantically stockpiling. Style Notes: This trend is not for minimalists. Standout acetate sunnies in a rainbow of shades have been making waves for some time now, and according to the style set and Karoline Dall, the trend shows no sign of slowing any time soon. Be brave in a cheery shade or choose something muted as a more subtle nod to the trend. Style Notes: While a statement-making style is tempting, you can’t deny the appeal of a timeless pair of sunnies that’ll see you through this summer and beyond. Go for a classic Ray-Ban Wayfarer à la Lucy Williams or look to tortoiseshell frames from Céline in subtle, low-key shapes that’ll last a lifetime. Style Notes: The most unexpected trend? We’ve spotted teeny-tiny sunglasses all over our Instagram feed lately, and we think this is the chicest choice for summer. To get in on the trend, look for ’90s-style rectangular silhouettes or ultra-pointy cat-eye frames.